VANTAA, FINLAND. Team USA, the reigning world champion women's tackle football team, began their title defense by thrashing Sweden 84-0 in the 2013 Women's World Championship in Vantaa, Finland on Sunday evening. It was the largest margin of victory in tournament history and featured outstanding efforts from a number of Chicago Force players. 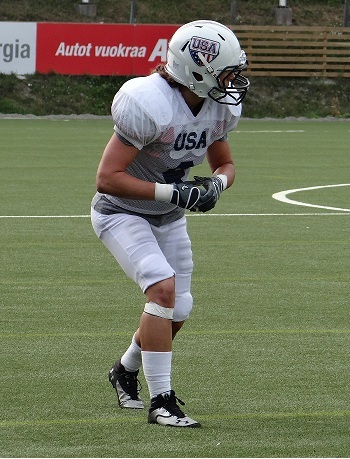 Team USA won the inaugural tournament in Stockholm, Sweden in 2010. This year the championship is hosted by the American Football Association of Finland and the event is sanctioned and overseen by IFAF (International Federation of American Football). Six teams qualified for the tournament this year: Pool A: USA, Germany, Sweden and Pool B: Canada, Finland, and Spain. Pool play will be completed this Thursday, with the medal games being played on Saturday July 6th at ISS Stadium. Team USA and Canada are the top seeds in their respective pools and are expected to meet in the gold medal game. This would be a rematch of the 2010 final in which Team USA overwhelmed Canada 66-0 in the first Women's World Championship ever played. Fourteen members of that 2010 american squad are also on this year's team, including Chicago Force quarterback and the MVP of today's opening game Sami Grisafe. There is a heavy Chicago Force influence within Team USA, as the Force have nine players and three coaches who were selected. Force players representing the USA are Grisafe, wide receivers Jeanette Gray and Ashley Berggren, running back Brandy Hatcher, lineswomen Dawn Pederson, Jamie Menzyk, Liz Okey, Tami Engelman and Kim Marks, and coaches John Konecki, Adam Lewandowski and Nick Djurjevic. All nine Force players were on the field in the opening game and contributed greatly to the US victory. Grisafe completed 12 of 16 attempts for 220 yards with 3 TD passes and added a rushing TD. A host of other players scored touchdowns for the United States including: Cassey Brick (3), Odessa Jenkins (2), and Adrienne Smith, Jeanette Gray, Ashley Berggren, Brandy Hatcher and Katie Sowers each scored a touchdown. Team USA had a balanced attack with 251 rushing yards and 285 passing yards, for 536 total yards of offense. By contrast, the Swedish team managed just 64 yards of total offense against the swarming US defense. The leading tacklers for Team USA were Jennifer Plummer, Vicki Eddy, Jen Welter, Rachel May and Leah Hinkle. "This was a total team effort - everyone contributed to this win," said US Head Coach John Konecki,"There is a lot of room for improvement and we will continue to elevate our level of play." Coach Konecki was also at the helm in 2010 and has high expectations for this team stating "anything less than a gold medal is unacceptable." The US team plays again on Thursday July 4th against Germany, a win would guarantee a place in the gold medal game. Additional info and live updates are available at wwc2013.com.